News - June Newsletter: Why Does K-Ras Display Oncogenic Specificity? 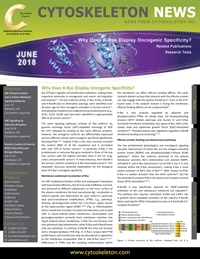 June Newsletter: Why Does K-Ras Display Oncogenic Specificity? Ras GTPases regulate cell proliferation pathways, making them important molecules in oncogenesis and cancer cell migration and invasion. The four isoforms of Ras, H-Ras, N-Ras, K-Ras4A, and K-Ras4B (due to alternative splicing), were identified over 30 years ago for their oncogenic activation in human tumors. Activating Ras mutations are single amino acid substitutions (e.g., G12C, G12V, G12D) and have been identified in approximately 30% of all human cancers. The same signaling pathways activate all Ras isoforms via guanine exchange factor (GEF)-mediated exchange of GDP for GTP, followed by binding to the same effector proteins. However, Ras oncogenic isoforms are differentially expressed aacross different cancers with oncogenic specificity significantly favoring K-Ras,. Indeed, K-Ras is the most common mutated Ras isoform (86% of all Ras mutations) and is correlated with over 21% of human cancers. In particular, K-Ras is the predominant or exclusive Ras gene mutated in three of the top four cancers with the highest mortality rates in the US: lung, colon, and pancreatic cancers. In most instances, the K-Ras4B is the primary isoform mutated in K-Ras-associated cancers. This newsletter discusses potential explanations for the biological basis of K-Ras’s oncogenic specificity.